Breaking News: Pundits Like Turkey, Too! Just what is James Carville thankful for during this holiday season? The politically minded folks who regularly grace your TVs and laptops do not, actually, live in broadcast studios under harsh lights and fall asleep with their faces smooshed on keyboards. (Only we here at Politico are that dedicated.) Like you, they have families that play football and stovetops that will be brimming with stuffing come Thursday. Politico rounded up some of Washington’s top news anchors, reporters, talking heads and other heavy-hitters and asked them what they were most grateful for this Thanksgiving. And here’s a Breaking News Update: Some can’t shake their snarkiness, no matter what the season! John King, anchor, CNN: "I am enormously grateful for the opportunity to visit 31 states in the past 20 months meeting dozens and dozens of the ordinary people that made this such an extraordinary election cycle. I am most grateful that I can focus now on the leaves changing colors, not states changing colors; that I can spend time with my wife, not my map; and for this, to borrow a phrase, Change I Can Believe In: more time with the remarkably patient Noah and Hannah King." Minority Whip Rep. Roy Blunt (R-Mo. ): "This holiday season, I am most grateful to have a happy and healthy family, the faith and trust of the people who elected me, and the honor of serving in the United States Congress. To those who work each and every day for their families and loved ones during these challenging times, especially our servicemen and women deployed to protect our country, you have the thanks of a grateful nation." 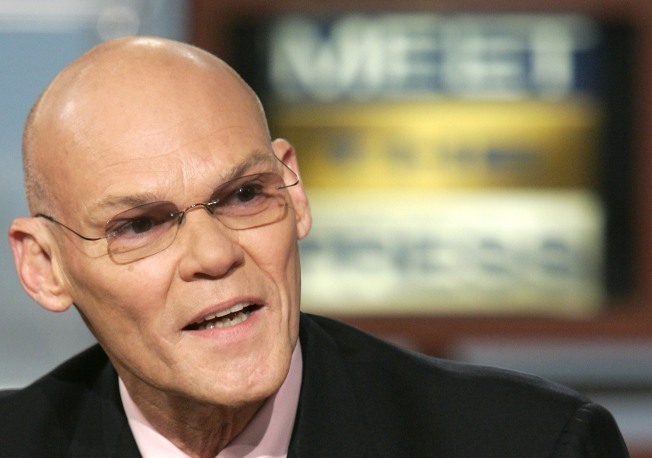 James Carville, political consultant and former strategist for President Bill Clinton: "The thing I'm looking forward to most about Thanksgiving is going back to Louisiana as I have 62 people coming over, so I won't be lonely. " Ari Fleischer, founder of Fleischer Communications, former press secretary to President George W. Bush: "I’m grateful that the Dolphins already have six times as many wins as they did all of last season." Patrick Gavin, co-author of the Washington Examiner’s “Yays and Nays” column: "In a tough economy and an even tougher business, I'm grateful that I still get paid to ask presidents for their opinion on low-riding pants and to snap photos of drunk journalists." Chris Cillizza, “The Fix” writer, washingtonpost.com: "I am INCREDIBLY thankful for my wife's tolerance of me and of our baby on the way." Alan Colmes, co-host, Fox News Channel’s “Hannity and Colmes”: "I’m thankful that America has finally seen the light and the country is finally in the right direction. " Gloria Borger, contributor, CNN: "That my twenty-something sons will be home with my husband and me to partake in our Thanksgiving Day tradition of staying home in our sweats and/or jeans, watching football — and that no presidential recount will get in the way!" Ana Marie Cox, contributor, Time: "Thankful for the usual stuff: Friends, family, etc., but especially grateful for their willingness to forgive me for my long absences while on the trail and my general inability to focus on anything else for 16 months or so….Thankful to Obama for personally doing something to prop up the Washington economy. Hello, 300,000 job seekers! We have a room you can rent!" Norm Ornstein, resident scholar at the American Enterprise Institute: "First and foremost, I am thankful to have my family, including my sons, my wife and my in-laws, around me for this holiday. Second, at a time of immense turmoil and uncertainty at home and abroad, I am thankful to have an outgoing president eager to make the transition the best one we have ever had, and an incoming president who is handling the process of preparing to be president better than any in my adult lifetime." Tammy Haddad, president, Haddad Media: "Three cheers to my husband, Ted Greenberg, for his patience and good humor through this extended election cycle. He is a great lawyer, father, husband, and friend to our extended Washington family." Gwen Ifill, “Washington Week” moderator, PBS: "I am grateful the election is over." Ron Bonjean, CEO of the Bonjean Company, former chief of staff to Senate Republican Conference Committee Chairman John Kyl: "I am thankful that my wife doesn't listen to a thing I say when confirming dates. We actually spent our Thanksgiving last weekend at her parents house in Wyoming due to mistakenly booking tickets for the wrong days back in August. So instead of staying home this week to celebrate the real thing, we decided to pack our bags again and make it a 'Very Vegas Turkey Day.'" Christine Pelosi, author, "Campaign Boot Camp": "Enjoying freedom, faith, family, friends, food and football. Thankful for my loved ones - especially my husband Peter - for our new president and all community organizers who work to make the future better, and for our brave service members whose families will have empty chairs and heartfelt prayers around the holiday tables. Happy Thanksgiving!" Rep. Marsha Blackburn (R-Tenn.): "The entire month of November is a reminder of all I have to be thankful for. It begins with my wedding anniversary, includes family birthdays, and ends with all of those who are nearest and dearest to us around the table. November elections add to the month and remind us of all the other things Americans have to be thankful for; our freedom and the opportunity to take risks, and our responsibility to leave our communities in better shape than we found them." Rep. Steny H. Hoyer (D-Md. ), House Majority Leader: It is a testament to the character of our nation, observed around the world, that the United States has the strength to change course and work together on a seamless transition of government. While we continue to work through an economic crisis, millions of Americans have reason to feel real hope on this Thanksgiving Day…We again offer our deepest thanks to our courageous men and women in the armed forces, especially those in harm's way in Iraq and Afghanistan…Finally, I am thankful today, and everyday, for my wonderful family. My children, grandchildren, and great-grandchild are a constant reminder of all the blessings in my life." Rick Klein, senior political reporter, ABC News: "On Thanksgiving Day, I will be thankful that when I wake up (quite late) I will have maybe eight new messages on my BlackBerry, and won't care about any of them. The only things happening in my world that day will involve football, turkey and family. It will be the first time since the campaign ended that I will feel not just relieved, but also relaxed." Mike McCurry, consultant with Public Strategies Washington, former press secretary to President Bill Clinton: "Most Democrats and Republicans I talk to really believe that we cannot afford another failed presidency and they seem agreeable to doing something about that – that’s got to be something really worthy of praise and thanksgiving." Shepard Smith, anchor, Fox News Channel: "I'm grateful that Robert Khayat has championed a renaissance in education at Ole Miss and made it a great American public university. Beating the Florida Gators in the swamp is now part of Rebels' pattern. For that I'm also grateful." Jeff Zeleny, White House correspondent, The New York Times: "There are a bounty of things to be thankful for: good fortunes, healthy family and, of course, a feeling of relief that the long presidential campaign has ended. (Even if the transition makes us long for the Iowa caucuses once more.)" David Shuster, anchor, MSNBC: "On this Thanksgiving 2008, I am most grateful to be [Bloomberg political reporter] Julianna Goldman's husband...and I'm especially grateful that Julianna didn't suffer permanent damage from the Obama press charter where the food, by all accounts, was disgusting."